Luxury goods such as premium food, cosmetics and perfume rely on beautiful packaging to deliver their vital on-shelf ‘wow factor’. The last thing that manufacturers and brand owners want is expensive, carefully crafted packaging defaced by poorly placed or badly executed coding. High-precision thermal inkjet (TIJ) printing and offline coding systems can provide reliable solutions to meet these quality challenges, says Richard Pether, director with Rotech. Stiff competition at the point of purchase calls for packaging which packs a big punch in the few seconds it takes to make a purchasing decision in store. Even premium brands are not immune to on-shelf competition, so the current global growth in demand for luxury goods translates directly into a bigger market for luxury packaging. Luxury packaging is expected to grow twice as fast in Western Europe as packaging overall over the next few years (3% per year versus 1.5%), according to packaging and paper research organisation Smithers Pira. Globally the picture is even brighter, with luxury packaging worth an estimated $14.2 billion in 2014 and forecast to grow to $17.6 billion by 2019. That equates to an average growth rate of almost 5% per annum, with cosmetics and fragrances accounting for the biggest chunk of the market (43% in 2014), followed by premium alcoholic drinks (22%) and tobacco (16%). 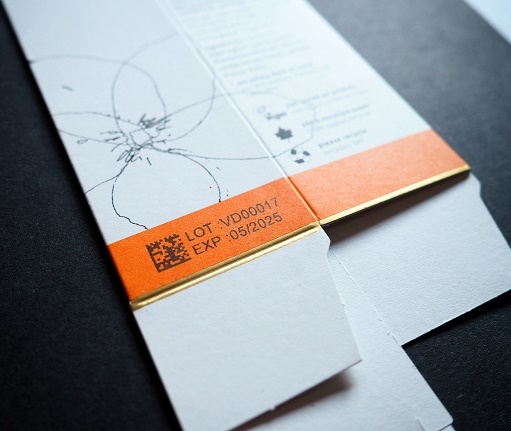 Luxury packaging means investing in expensive materials and novel designs, many of which can present a challenge for the coding systems used to overprint important information such as batch numbers, barcodes and expiry dates. These are often the last things on the minds of packaging designers who are aiming to catch the eye of luxe-loving consumers. Elaborate embellishments, unusual shapes or an awkward printing position can leave online printers struggling to position codes correctly on the finished product. For example, a printer might have trouble combining the speed and precision required to print consistently into a tightly-defined space that’s too close to the conveyor, and this can result in ink ending up on the belt rather than the product. Moreover, premium packaging commands a premium price, so even relatively low-frequency errors are likely to be expensive in terms of packaging waste. Whatever the issue, offline coding offers an affordable and practical solution. Coding packaging such as cartons, sleeves or pouches offline before they are filled enables them to be brought to the production line ready printed. This has considerable advantages for code quality, since coding the pack in its flat form results in a consistently clear, perfectly positioned code. Furthermore, where an online coder is struggling and creating a bottleneck, removing the process from the critical path can speed up the entire line and deliver significant efficiency improvements. Offline systems take a stack of flat packages and use a friction- or vacuum-based feed system to pass them through the printer and out to a finished stack. For example, Rotech’s stack-to-stack feeding technology can pick sleeves or cartons from a stack, accurately print the necessary codes, and place the printed sleeve neatly onto another stack at speeds of up to 400 packs per minute, depending on the application. The short production runs often associated with exclusive or limited edition luxuries are another reason why manufacturers might consider adopting offline coding. Whether production takes place in small batches on a single production line or on several lines operating in parallel, a single offline system should be able to meet all their needs, rather than having to install a printer on each line. Meanwhile the technology used for overprinting coding information has been evolving. Until relatively recently, continuous inkjet (CIJ) was the obvious choice for manufacturers looking to print essential data onto a variety of packaging. That’s because early water-based TIJ systems struggled to cope with printing on non-porous substrates. The arrival of solvent-based TIJ technology means that printing on high-end consumer-ready packaging is no longer an issue, however glossy the surface. TIJ systems can print at a resolution of up to 600dpi. Not only does this provide absolute clarity, but it also allows users to adapt the font of any overprinted information to match the carefully-designed branding on the rest of the package. Font-matching may be less of an advantage with dates and batch numbers, but where coding is used to identify the particular product variant inside the package – such as the shade of lipstick, for instance – it can provide a useful reinforcement for the package’s overall branding. On the other hand, the colour and print density of TIJ characters can also be varied, so a complementary colour or lighter print can be used if the brand owner prefers coded information to be clear without being too eye-catching. In contrast, CIJ systems typically print characters using a 7x5 matrix, which doesn’t provide great resolution and cannot hope to match specialist fonts. TIJ also offers more general advantages over CIJ in terms of convenience, cleanliness and cost. The upfront cost of TIJ systems has dropped dramatically as they increase in popularity, which the cost of consumables means TIJ can be up to four times less expensive per character. In addition, rather than the bottles of ink and messy reservoirs of make-up solution associated with CIJ, TIJ systems use a clean, compact, cartridge-based systems that’s virtually maintenance-free, with no associated spillage or mess. Of course, TIJ is not without its limitations and is not perfect for every application. That’s why Rotech continues to work with partners to provide coding solutions based on the full range of printing technologies. Counterfeiting is yet another challenge facing the owners of luxury brands, with growing demand for luxury goods offering a strong incentive for criminals to try their luck in the potentially lucrative fake goods business. TIJ can help strengthen anti-counterfeiting measures. While the main coding information can be printed as normal, UV-fluorescent inks can also be used to add security information to the pack that only shows up under UV lights. What’s more, the systems used to feed packs through the printer can also be used to add a security label.